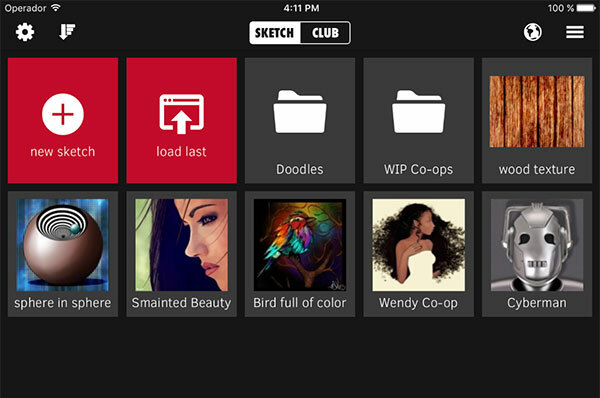 The Gallery screen shows all your sketches you have stored on your iPhone / iPad. Tap and hold on a sketch for options to rename, duplicate, move to folder, or delete. Tap the "new sketch" button of course to start a new sketch. The "load last" button lets you quickly hop back into the last sketch you were working on. For a demonstration of creating and using folders, check out this video on YouTube. The Actions Panel in the Gallery gives quick access to creating or importing a sketch, hopping over to the online Community, and extra tools for bulk export, wifi sharing, and usage statistics.